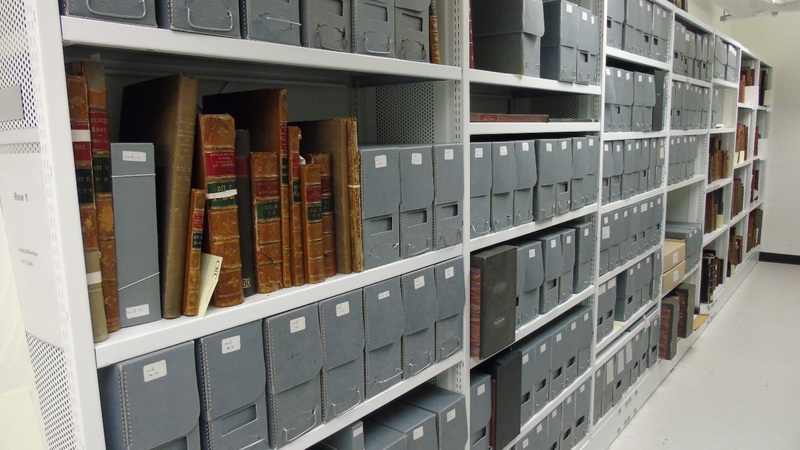 The collection consists of 136 boxes and typical types of damage found was slumping in boxes due to the vertical storage, and creasing and tearing due to lack of internal protection. 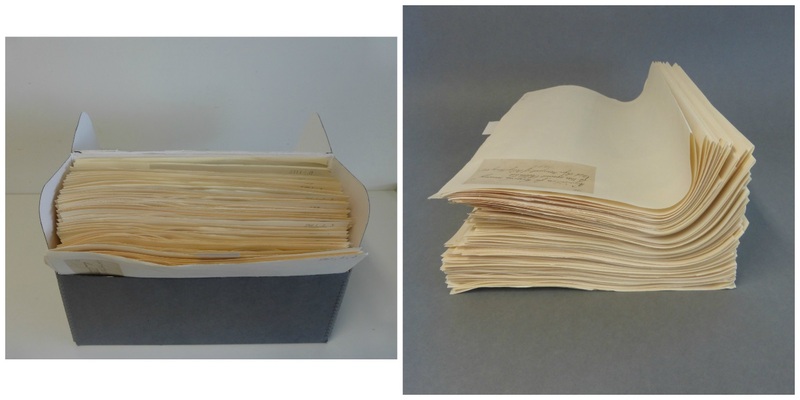 The arrangement of the collection on the shelves was also not ideal, with bound volumes and boxes mixed together along with outsize material, so we also wanted address the use of space with this event. So, why did we decide to crowdsource this work? Firstly, we wanted to reduce the time needed to rehouse the collection. It was estimated that it would take a conservator nine weeks to rehouse the material, whereas we hoped to complete this work in just two days. Secondly, there is a high demand for volunteer experience in conservation, but we are unable to offer this to everyone due to lack of space and staff time. This way we were able to offer a high quality experience to a larger number of people. 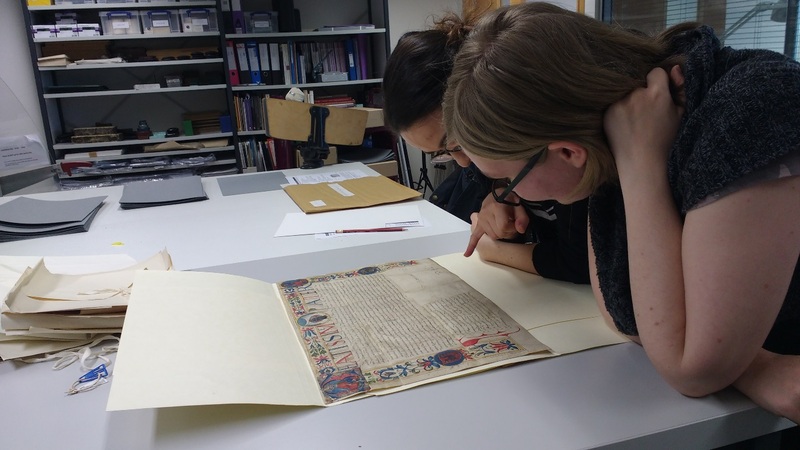 We also saw this as an opportunity to educate participants on the role of conservation, and the best method of rehousing archival documents and as well as promoting conservation activity at the CRC. Each day consisted of a training session in the morning, followed by practical work. In the afternoon, attendees were joined by staff members from the CRC who talked to them about their roles, and gave advice on how to get into a career in heritage. Overall we thought that the event was a big success. One attendee commented “I would also like to say a huge thank you for providing me with the opportunity to take part in such a interesting and inspiring event, I honestly took so much from it and I will keep looking for any future events with you”. It was well attended and we also had students travelling from Northumbria and Lincoln University to take part. By the end of the event, we had rehoused 110 out of the 136 boxes. 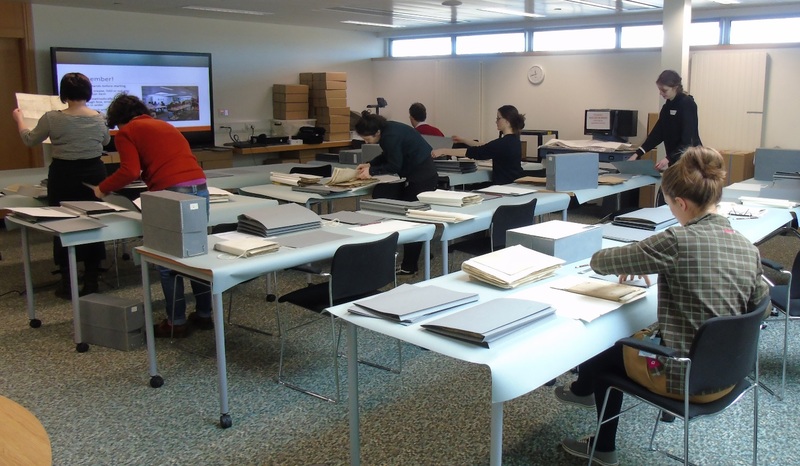 To complete the rehousing of the collection, we held another half day event with participants who attended the first event, and had expressed an interest in doing more similar work at the CRC. Although the use of volunteers can never replace the work of a trained conservator, we believe that this event was a positive first step to stabilise the collection. It is hoped that this work will help to secure further funding to carry out interventive repair of the collection in the future. I’d like to say a big thank you to all those who attended and helped to rehouse the collection. Also, many thanks to the CRC staff who helped to host this event. We hope to carry out more like it over the next year! Here are a few top tips for any of you who are thinking about holding a similar event! Choose your collections carefully and do a risk assessment to get buy-in from senior management. Think about the size of group – we had 12 participants per day and three staff members in the morning session and five in the afternoon. This ensured that the volunteers were supervised at all times and no one was left stuck for too long. Give clear instructions and training – things that seem obvious to a conservator, may not to a volunteer, make sure you give clear guidelines and check up on work. Double check all old boxes and folders before throwing them away! Just in case there is an item that has been left inside. Scrub out the reference number on the box, or flat pack the boxes before recycling to avoid any confusion if the box is reused. Consider the amount of time needed before the event to plan and organise it. You will need a detailed timetable of the day, and guidelines on how the material will be managed to avoid any confusion or panic on the day. You will also need time to create training resources to make what you are doing as simple and clear as possible. 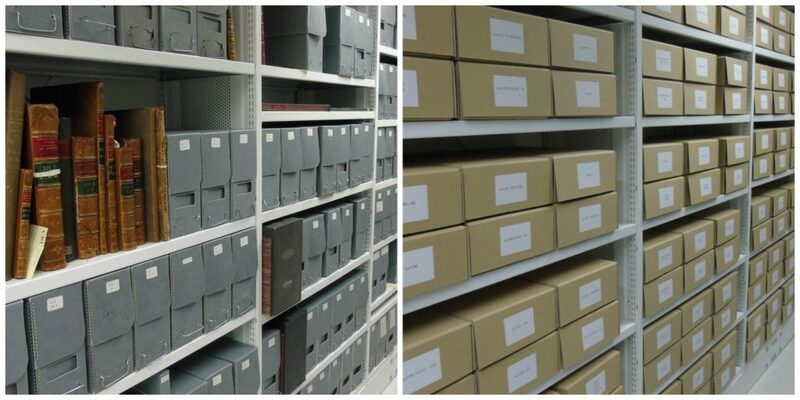 After the event you will need time to reorganise and relabel boxes, and make new finding aids. It took me three days to do this for 110 boxes, which is longer than I initially expected. You will need to think about how the collection will be moved to the venue from the store room, how you will make sure that the material does not become disordered or lost, and what security procedures you will have in place. Consider how much your collection might grow when it is rehoused into more suitable housing. Some of our boxes were previously overfilled, and some underfilled. We found that the collection grew by two metres after this event. Overbook the amount of volunteers you need. Since this was a free event that was advertised to the public, we expected a few people not to show up. Out of a possible 36 volunteers, 24 of them turned up on the day. If we had just booked the minimum amount that we needed, we may not have completed so much. Give something back to the volunteers – we included complimentary catering to make them feel valued. This entry was posted in Events and tagged crowdsourcing, laing, rehousing, students, volunteers by conservation. Bookmark the permalink.